I’ve been around and not gone anywhere. Last couple of days have been busy and I am trying hard to make that big “switch” happen soon. Some interesting things have popped up and kept me busy. In the between of all this it was a great night to attend dear friend Ankit’s Birthday celebrations at his new beautifully done-up apartment. Rad had a soar throat so she sounded just like Bipasha Basu from the movie “Jism” – I am sure Ankit enjoyed hearing her talk like this. 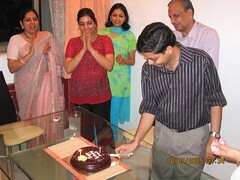 It was good fun since we all met once again after a long while: Arun and wife included. Of course Pankaj is away holidaying in Europe (Lucky son-of-a-gun). All in all – we had some good laughs and I think Rad’s gift to Ankit rocked – A big bean bag. Ash had a great point which I wonder how I missed out seeing – GREAT NEW POSITIONS for those boring nights. Now only if Ankit dear would share his experiences. It’s my day off today – I am busy working on some personal projects and just rushing out for a meeting. Meanwhile enjoy more photos on Flickr.